Better hurry! Only one left!! Hey Floriduh Men (the surviving ones, at least!) bet this housecat would deal with your pet cassowary problem! Me thinks, this Kitty wouldn’t be satisfied with “bags” of treats. Maybe a fresh slab of beef, 4x a week? I love that cough/cold commercial where that Animal Caretaker, in the Wildlife Zoo, has to sneak up on Zeus (without coughing) to “DO NOT DISTURB” the King. I hate that commercial. How badly run does a zoo have to be for the tiger feeder to have to sneak in while kitty is sleeping to bring him his nice, tasty and yummy-smelling dinner. Yeah, I tend to take things a bit literally. I’d adopt this Ki-Ki right now! How do you pass up that face!!! Big cats = big appetites = big poops. 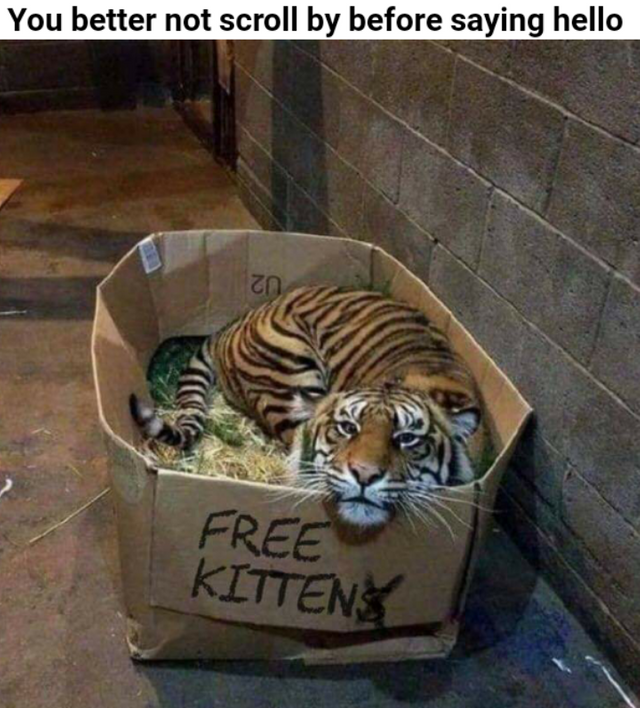 Imma pass on this kitteh, I bet he needs a litter box big as an Olympic-size swimming pool. ….and a front-end loader to sift it daily! That’s a visual in my mind that makes me feel that Free Kitten and yesterday’s Floriduh Cassowary should to duke it out. But obvs, I am on Team Tiger. Litter box? I doubt that a cat that size wastes energy on a litter box. What’s gonna happen if somebody catches on that he’s in the area? He won’t be a coyote snack, I can bet on that. Shere Kan iz dat you?